Unlimited Creations: Mobile Sounds, Sights and Sites is a research repository dedicated to the history of Filipino American mobile DJ crews in the San Francisco Bay Area. The site is based on oral histories originally collected for Legions of Boom: Filipino American Mobile DJ Crews in the San Francisco Bay Area, forthcoming on Duke University Press in Spring 2015. This site offers an introduction to that history, but it is also meant to serve as a dynamic, user-generated research repository. Much of our visual and audio content is meant to be user-generated, by you, the reader. This vibrant music/party scene began in the late 1970s and lasted through the early/mid 1990s. 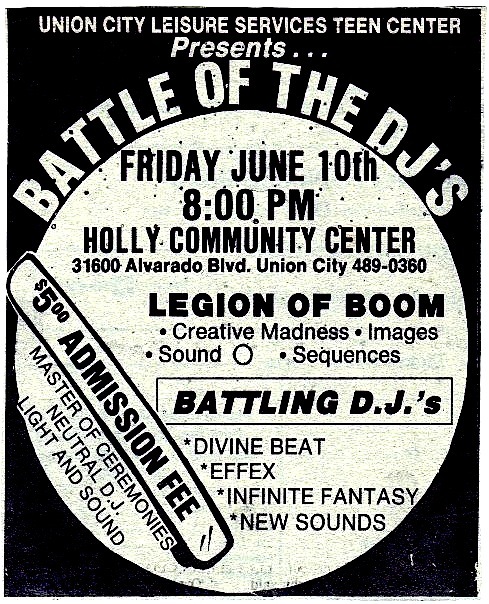 Over that time, the scene gave birth to at least 100+ different mobile DJ crews whose showcased their skills at school dances, garage parties, weddings, etc. Like England's Northern Soul parties, the South Bronx's proto-hip-hop scene or the history of the Jamaican sound systems, the Bay Area's mobile DJ scene brought together overlapping communities of DJs, fans, their families and others. Despite its size and longevity, the mobile scene drew little attention from media entities such as record labels, or newspapers, radio/television. Unlike other DJ-based scenes such as disco or techno, there were few recordings left behind to help informally document its existence. However, DJs and fans have their own memories of the scene and over the last ten years, more of their stories are being shared, helping shape a nascent history of the mobile crews. If you have 1) stories form the scene, 2) scans of fliers/cards/etc., or 3) audio/videos of mobile DJ performances that you would like to add to the project archive, please fill out our submission form. Meanwhile, updates to this site and the book will be shared via our Facebook page. browse the Crew Database, Mobile Scene Maps or Schools Database. view the Visuals archive of business cards, fliers and videos. listen to the Audio archive of DJ mixes. This project is maintained by Dr. Oliver Wang (California State University, Long Beach), author of Legions of Boom. Version 64 id 63953 of this page, updated 05 January 2015 by Oliver Wang. Created by Oliver Wang. Unlimited Creations: Mobile Sounds, Sights and Sites by Oliver Wang. Help reading this book.